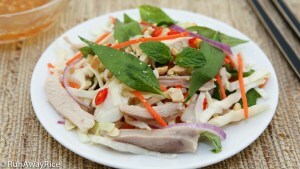 This easy recipe for Purple Cabbage Chicken Salad (Goi Ga Bap Cai Tim) is one of my favorite light and healthy salads. 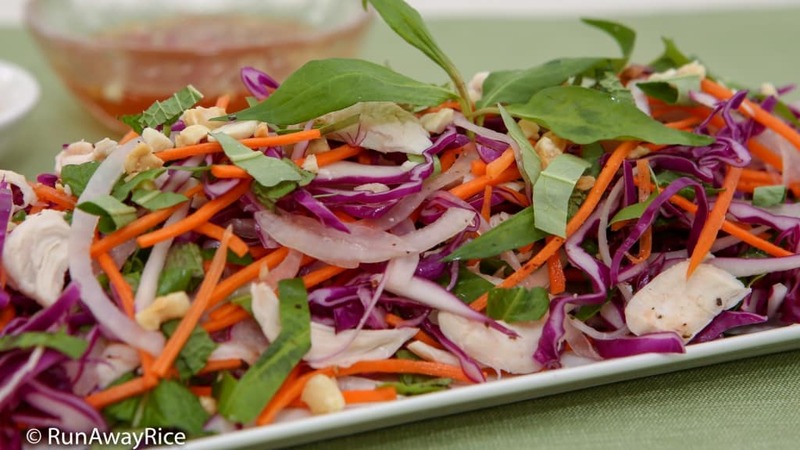 Loaded with nutrient-dense purple cabbage, crunchy carrots, lean chicken, marinated onions, fresh herbs and a zesty dressing, this vibrantly colored salad is refreshing, flavorful, and down-right satisfying. Super easy to make, this healthy salad uses fresh vegetables and boneless skinless chicken breast. The lime juice fish sauce dressing is bold and tangy. Toss it into the Purple Cabbage Chicken Salad or serve on the side. This scrumptious salad makes an amazing appetizer or main dish. Enjoy! Use either chicken breast or chicken thighs. 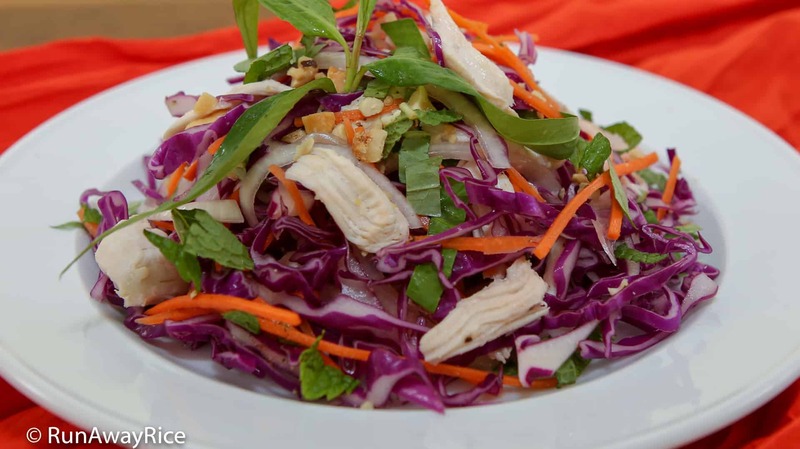 For this Purple Cabbage Chicken Salad recipe, I use chicken breast tenderloins. The pieces are smaller and take just 10-15 minutes to cook. If using whole breast pieces or thighs, cook until the juices run clear when pricked with a knife. Any type of meat works with this salad. Try turkey, lean pork, or shrimp as alternatives to chicken. Optionally, add pan-fried tofu and swap out the fish sauce in the dressing with soy sauce for a vegetarian option. Use a salad spinner to remove the water from the cabbage. Any excess water may make the salad soggy and prevent it from soaking in the delicious dressing. I serve the dressing on the side because I find most people like different amounts on their salad. If you like, you can toss the salad together with the dressing. If serving this way, don’t combine the salad with the dressing until you’re ready to dine. If the salad is combined with the dressing and left sitting for too long, it may become soggy. Store any remaining amounts in the refrigerator. 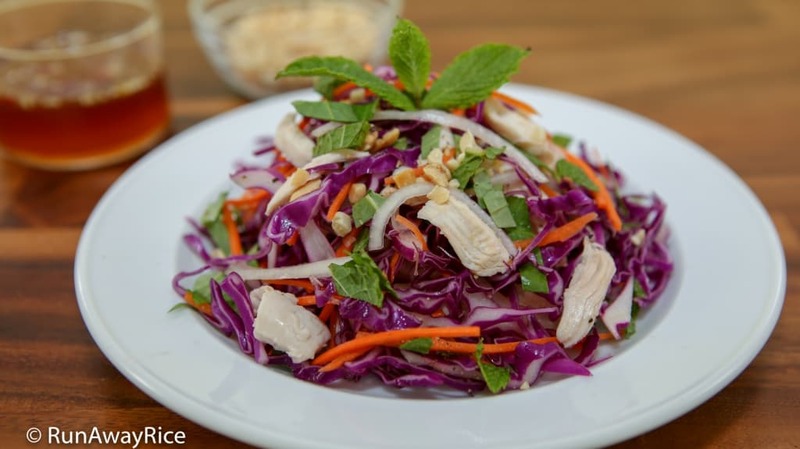 Enjoy the Purple Cabbage Chicken Salad within 2-3 days for the best flavors and freshness. Remove the skin from the ginger and discard. Bring a medium pot of water to a rapid boil. Add 1 tsp salt, the ginger and the chicken. Bring the water to a boil again. Reduce the heat to Low. Cover the pot and cook the chicken for 15-25 minutes depending on the thickness of the meat. Transfer the chicken to a bowl and allow to cool. When the chicken is cool enough to handle, tear it into small pieces. Remove any damaged or wilted outer purple cabbage leaves and discard. Quarter the cabbage. Remove the white core from each section and discard. Thinly slice the cabbage. Transfer the purple cabbage into a large salad spinner and rinse with cold water. Drain well. Spin the cabbage dry. Peel the carrot. Cut into 3 inch long sections. Shred the carrot into a medium bowl using a mandoline. Thinly slice the yellow onion. Transfer the onions into a large bowl of ice water. Let soak for 5 minutes. Drain the onions and transfer into a medium bowl. Add sugar and white vinegar and toss together. 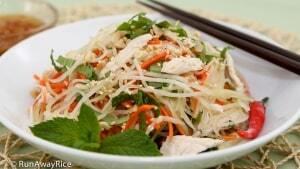 Roughly chop the spearmint and Vietnamese coriander. 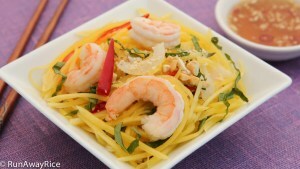 In a small bowl, add the sugar, lime juice and fish sauce. Stir together dissolving the sugar. Add the chopped garlic and chilis and combine together. In a large bowl, add the purple cabbage, carrots, shredded chicken and marinated onions. Toss together combining everything well. Top with freshly ground black pepper and the chopped herbs. To serve the salad, transfer a generous amount to a large plate. Top with a spoonful of the crushed roasted peanuts. 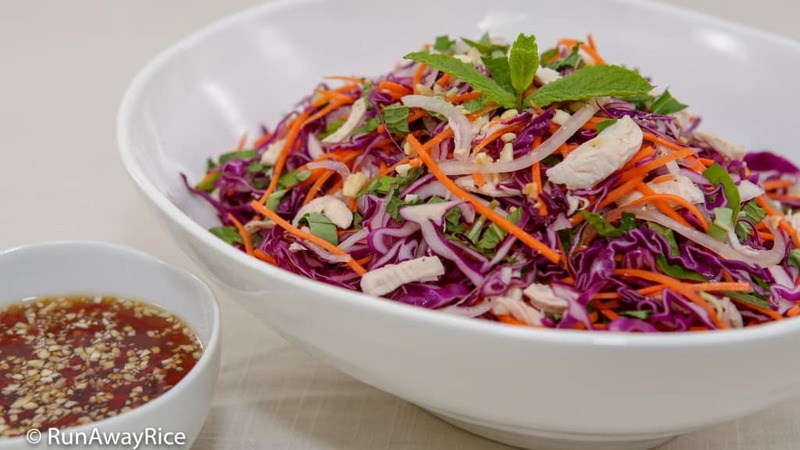 Serve the Purple Cabbage Chicken Salad with a side of the zesty dressing. Store any remaining amounts in the refrigerator. Enjoy the salad within 2-3 days for the best flavors and freshness. I serve the dressing on the side because I find most people like different amounts on their salad. If you like, you can toss the salad together with the dressing. If serving this way, don't combine the salad with the dressing until you're ready to dine. If the salad is combined with the dressing and left sitting for too long, it may become soggy. I’ve been trying to eat more salads in an effort to drop some pounds. I really like this recipe, great instructions, easy to make and so much better than boring lettuce salads. I am packing my leftovers for work lunches. Thanks for this!